Although The Bike has been around for decades, it has recently opened their hotel that adjoins the casino in December of last year. At the same time, some of the other areas have also been remodeled and upgraded. The new hotel area looks upscale and classy. I have not stayed at the hotel so I cannot review the rooms but the lobby area is brand new. 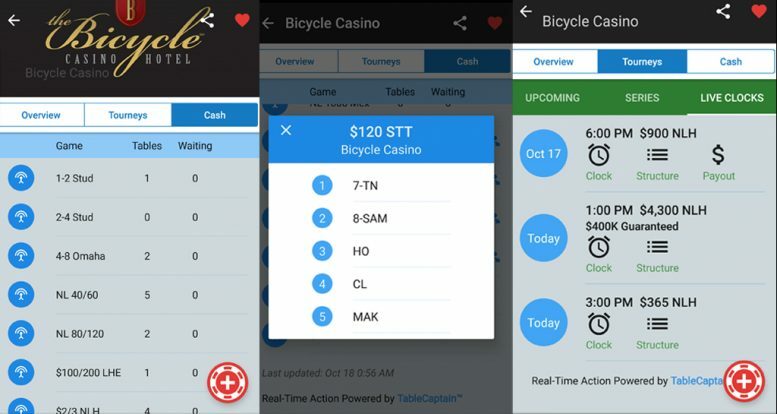 For me, the best new feature is the Bike using a service for poker rooms called Poker Atlas, To keep track of all the tables in real time, they have a touch screen for the dealer to keep track of the players using their player cards. 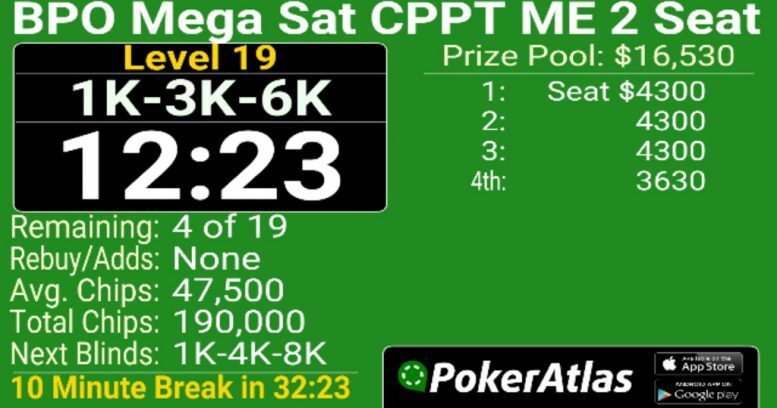 As you can see below, the Poker Atlas screen even shows the pictures of the players at the table. Poker Atlas not only provides these hardware devices, they have an app (iOS and Android) that allows the user to see everything in real time. As you can see below (left), the list of active cash games are shown in real time. If there is a waiting list list (middle), you can touch that line and see the people on the waiting list in real time. If that’s not enough for you, you can also see the upcoming and active tournaments in real time (right). 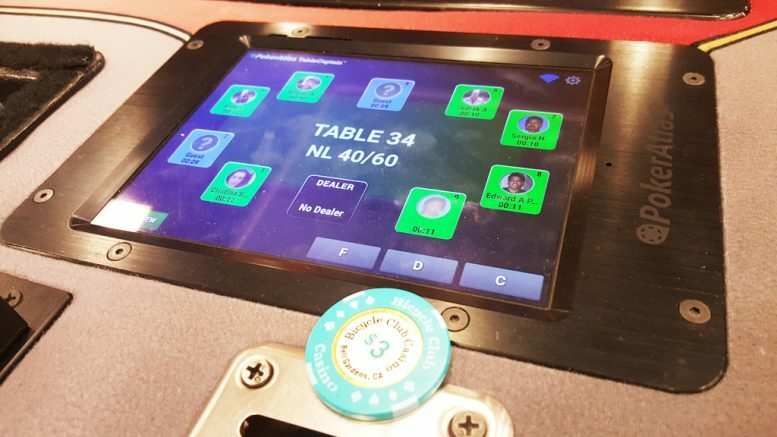 By simply touching the “Clock” icon, you can literally see the same clock that the players are watching on the screens in the poker room. This is perfect if you are playing a cash game, while waiting for your friend in the tournament, you can visit them during the break. It’s also perfect for the tournament player during the break to make sure to come back on time. Hopefully, all casinos will start using Poker Atlas to make life easier for the players. 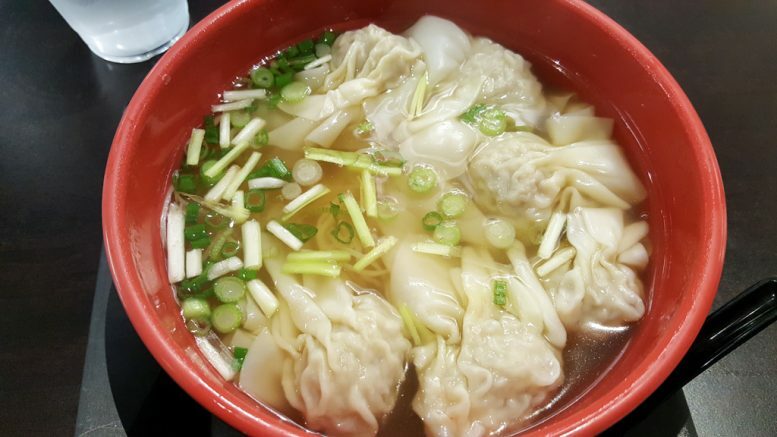 The Bike still has food service at the tables, and the restaurant that used to be in the Asian Games area is now called Phoenix Cafe and now serves Asian food, like Wanton Noodles (shown below). You order your food at the counter and they give you a number and bring the food to your table. This Cafe is open from 11 am to 2 am. There is also a 24 hour bakery that serves Starbucks coffee and other similar items. If you are hungry, you should get your food at the poker tables. For some reason, the carpeting is still the same old worn out one they had before. I assume they will be replacing it in the near future. That would definitely give it a new updated look, if and when they do that. All in all, with the new hotel, the Bike is one step closer to matching the amenities at Commerce. For the casual player, the Poker Atlas features are great and I will certainly be using it to plan my trips to the Bike. 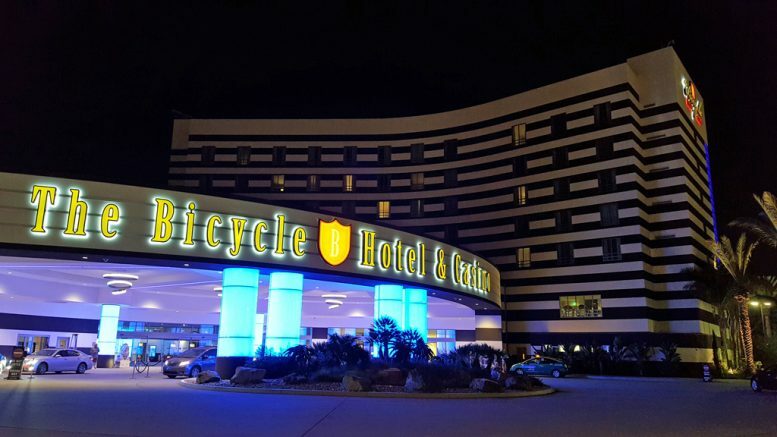 Be the first to comment on "Bicycle Hotel & Casino Quick Review"